As you might have heard during the latest episode of White Roof Radio, I’m really having some anxiety over owning a MINI. I’ve been driving these cars since 2003 and never have I had these feelings toward any of the MINIs I have ever driven. I’m sure a good part of that anxiety is caused by this damned nanny screen. Every little thing that goes wrong with this car causes all manner of error messages, lights and sirens. Every. Time. I start the car. Not helped by the fact that I really don’t like MINI Connected and never use it, but that’s a topic for another day. Another reason for the anxiety started with my most recent break-down. This is the first time a MINI has left me stranded on the side of the road during the summer with 115 degree temps. And, I was exposed to these delightful temps for the better part of 5 hours. This is something that I really do not want to happen again. 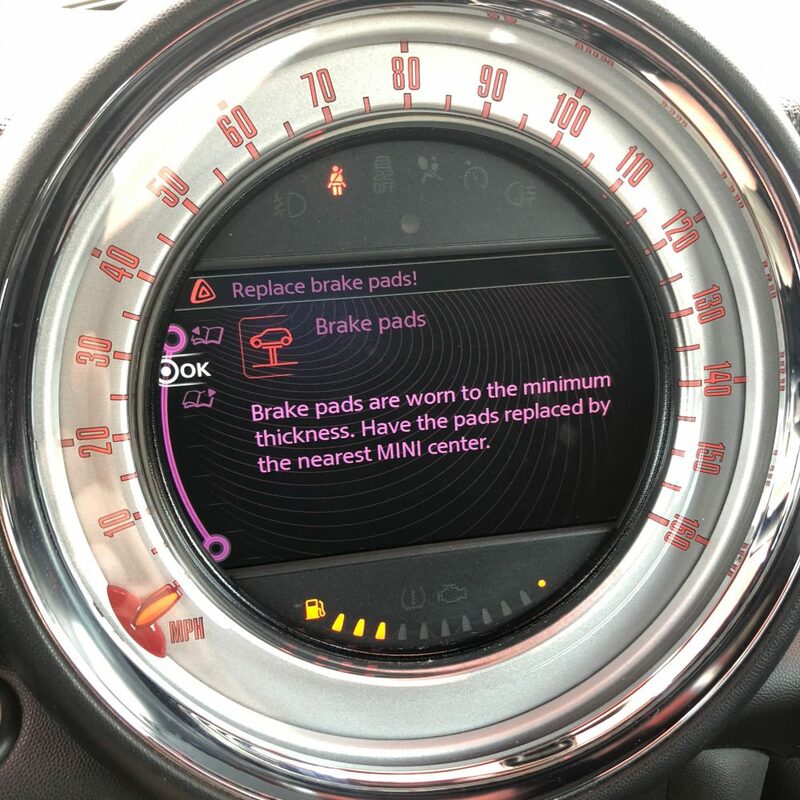 The issues I have, besides the nanny screen this car has, is the fact that this is a 2013 MINI Cooper with 80,093 (as of 8/20/2018) miles on the odometer. We all know that I have officially entered the danger zone for this make and model of car. While I have an extended warranty that will remove the sting of a major repair like something going wrong with the top, or the inevitable turbo failure, there still exists that possibility that this could happen and leave me stranded in hot weather, in the middle of the Sonoran desert or both. That is something that is truly making me crazy. What’s the fix? Getting into something newer would do it, but as I’m stuck with Hank for another year or two, I have some time to plan. Which brings me to the other point I made on the show; I think it’s time to leave the MINI brand. That last part hurts and it hurts a lot. And this will be a topic for ongoing discussion I am sure. The short version is that I can no longer afford to buy a new MINI and can no longer afford to support care and feeding of a late model MINI. And, I really don’t have the time for all of the care and feeding the older cars require. I’m looking for a replacement for Roxy. I want a car that I can put 300K miles on, drive for 10 years and only have to worry about wear and tear items. I no longer want a car where trim pieces come off in the car wash. Where mirrors fall off. Where interior bits fall off. Where very expensive mechanical failures are not the exception, but the norm. I love the car and I love the brand, but neither of those things love me back. To that end, I am pretty sure it’s time to move on. This is tough. I had a bone stock 2010 R56. I loved that car. Little issues here and there, but fun to drive. And then I passed 100K and the repairs got bigger. My last repair (at over 140K miles) was over $3,000–more than the car was worth. After the repair, it ran like a top, but that bill was the last straw for my wife. I paid around $18,500 for my car. When I added up all my service/repair bills, I had spent over $10K to keep that car running. Moved to a 2017 Subaru Impreza. Impressive features and great new platform for a lot less than a new MINI, but it was not a driver’s car. I desperately missed my MINI. But then I had endless issues with the infotainment system. It got so bad that Subaru bought the car back. I drove a lot of cars looking for a replacement. I am a hatchback/wagon guy, but my bad back likes getting into and out of a taller vehicle. In the end, my Subaru dealer made me an offer on a Forester XT that I couldn’t refuse, and so I am crossing my fingers and hoping that it works out. So far, I love it. I didn’t get all the tech, but I wanted the XT’s engine. It has the WRX engine so it’s got good power (250hp), and the suspension on this model is tuned in a way that I like. One big minus, it has a CVT. Subaru won’t be offering the XT on the new Forester platform, which is a shame…because it is actually fun to drive. I don’t fit in many roadsters. I have considered buying a used MINI, just because I fit. And maybe I would be OK with the repair bills if it weren’t my ONLY car. But, if I were in your shoes, I think it would be hard to not look at a Mazda MX-5 (if you still wanted a roadster) or a Subaru WRX. With Mazda, you can get a normally aspirated engine, manual or auto (NOT a CVT). Had I not bought the Subaru, I would have bought the Mazda CX-5. A little low on power, but fun to drive. If I fit in an MX-5, I would have owned one long ago. With the WRX, I would just get a basic model–in fact, were it not for my back, that probably would have been the car for me. Subaru styling is not my favorite, but I genuinely enjoyed driving the WRX on my test drive. While I like the MX-5, I don’t fit and my passengers don’t fit and for my next car I want a roof. I’ve cured the drop-top bug with this MINI. You also aren’t the first person that I know of to have switched to Subaru with somewhat favorable results. I will definitely keep that in mind when the time comes. I’ve always liked the WRX, but that is another car that would be wasted on my commute. Well you had a good run. I’ve listened to your show for a while, not 14 years though and I appreciate your honesty. You have helped me actually to stick with the Mini brand. Wish you had joined us in Keystone. The Mini community is awesome. I ended up in a very similar situation DB, the F-gen MINI does very little for me and the newest 2nd gens are now 5 years old and I wanted something much newer. I’ve had a 2001 & 2002 R50, a 2002 R53 and a 2007 R56 S, the R53 being my favourite. Bought a 6 month old Toyota GT86 earlier this year, the way it goes down a road and eggs you on reminds me of my first gen cars. Sure the engine isn’t the best, but the chassis/steering/gearbox and RWD balance are superb, it’s constantly goading you into having fun. I’m sure I’ll be back one day, but the combination of high purchase price + poor retained value, unfavorable (IMO) looks and the lack of “WANT ONE” factor has sent me elsewhere for the time being. I drove that car once and really enjoyed it. Thanks for stopping by Ollie! I understand your anxiety. I’m am the poster child of what NOT to do when buying a new MINI. Didn’t get it inspected prior to purchase, didn’t do the research on the N14 and did not get an extended warranty. But you’re not me. You DO have an extended warranty, you got the better engine and you have a local mechanic that knows MINI. You also know the brand and the models to a “T” and have The Good Reverend on speed dial (among others). If I were in your shoes the only thing I’d add is AAA Roadside Assistance and call it a day. When your loan drops to something more manageable, I’d trade in the Roadster for a used Gen 3 Hardtop. It’ll be more reliable, more comfortable and still a ton-of-fun to drive. Speaking of your commute, can you not shift your hours so that you show up at work later, or earlier to avoid traffic? What you describe sounds brutal. Traffic here in Nashville has gotten really bad over the years, so I now leave for the office at 6:30 to avoid it. It’s made all the difference in the world and I enjoy driving in in the morning. Oh, you’d better believe I have roadside assistance. Get it with my insurance. It has saved me more times than I can count! My schedule is pretty flexible to save on my commute, but since my day starts early at home (usually around 0600), that means I’m heading home from the office at around 1600. That time of day, 1 way, it’s 45 minutes to an hour to go 30 miles. And, this is actually BETTER since I moved. Used to be 1:00 to 90 minutes to go a shorter distance. 1 way! Sorry for the late reply and thanks a ton for the comment! Hang in there DB!! Just bide your time, and be ready when the opportunity presents itself. My experience of the F series is that it is light years beyond the R56 (‘touch wood’). I have been listening to WRR since episode 9; and I attribute some of my loyalty to MINI because of your show (sometimes I blame you guys as well)! In 2007 I traded in my R50 for a R56 MCS built to my specification; and there was a moment that I considered the risk of owning a turbo charged car – my first at that point – but I dismissed that fear, because I believed BMW knew what they were doing…. I ended up keeping that R56 for 10 years and put on 100,000km (62,000 miles), and thank goodness for WRR and the broader MINI community. As much as I loved my R56, it was brittle, and towards the end I could see a growing list of things that needed to be replaced just to keep status quo. It was also very depressing following the FB N14 Survivor Support Group – but I also valued their advice and knowledge. At Christmas 2017, I ended up trading in the R56 for a manual F54 JCW Clubman All4 – once again I attribute / blame WRR – specifically Gabe. A manual F54 (let alone a JCW) is very rare in these parts (Australia). This specific car had been a customers order that had cancelled when they realised they couldn’t actually drive a manual. The dealer was keen to move this F54 before Christmas and did a great deal – the change over price was $1000 more than ordering an F56 MCS at a similar trim to my R56. So this Clubman was quite a bargain – others MINI owners have described the Clubman as the “loss leader” of the MINI range – which is a shame, my JCW is an amazing and distinctive car, not just in technology and performance, but also reliability. The day I first picked up the Clubman I also stopped at the dealers parts desk to pickup 2 bottles of oil – my R56 experience showing through. 9 months in to owning the Clubman and I havent had to top up the oil (I do regularly check – thanks to WRR) and there have been no other issues. I even managed to get a SW upgrade to Apple CarPlay. Perhaps it is the case of 3rd time lucky! Or in this case, 3rd series MINI lucky! !